or just a special gathering (smoking or non-smoking), St. Charles Cigar Club is the place to hold your event and celebrate in style. To receive more information on how to make your reservation, please complete the online INFORMATION REQUEST form today. Gather your co-workers and clients and enjoy an afternoon or evening in the St. Charles Cigar Club Mobile Lounge. We can meet at your home, office or favorite restaurant and give you a corporate event experience like no other. 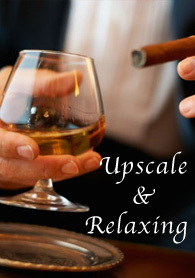 A cigar oasis for your next meeting, retirement party or to just relax and unwind with a fine cigar. Spoil yourself and your guests at your next birthday party, golf tournament, retirement party, reunion, wedding or any private event. The St. Charles Cigar Club Mobile Lounge will be your very own private cigar sanctuary during your next event. The mobile lounge will allow you to celebrate in style and enjoy a fine cigar.